The last 100 years have seen the dramatic spread of an evolutionarily unprecedented environmental change. Across huge areas, the spatial patterns and temporal cycles of light and dark that had previously remained approximately constant have been disrupted by the introduction of artificial nighttime lights from streetlights and other sources. Longstanding concerns about the implications for scientific astronomy and aesthetic enjoyment of the night sky have been joined in recent years by growing awareness of potential effects of artificial nighttime light on human health, ecological processes and ecosystem services. 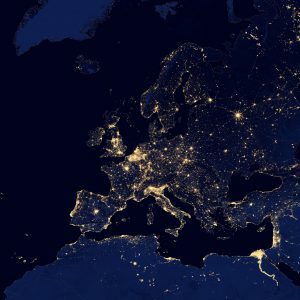 Th e spread of artificial nighttime light raises major biological concerns given that light and dark provide critical resources and environmental conditions for organisms and play key roles in their physiology, growth, behaviour and reproduction, including the entrainment of internal biological clocks. Indeed, it has long been recognised that light pollution of the night is likely to have profound consequences for the structure and functioning of populations and communities. The overall objective of the Ecolight project is to determine ecological impacts of artificial nighttime lighting, particularly how that light influences population abundance, species composition and community structure. Our research encompasses a wide range of approaches, including field observations, experiments and analyses of satellite imagery.